Baltimore—The Md. Department of Human Services (DHS) Child Support Administration (CSA) today announced the roll-out of an enhanced electronic version of Form 980, Application for Child Support, which can be accessed through the myDHR service portal. Residents already use myDHR to apply for a number of services and programs, such as food, cash, energy, and medical assistance. With the addition of the child support application, myDHR is a user-friendly, one-stop shop for Marylanders who are eligible for a range of benefits and services. Previously, applicants submitted their applications for child support to an external site managed by a third-party service. With the elimination of this third-party service, applications are now automatically uploaded to the myDHR database in real time, thus improving efficiency. An upfront pre-screening process verifies eligibility, while the intuitive interface helps increase accuracy by guiding customers through the application process and ensuring that the form is filled out to completion with the most up-to-date information. “Maryland parents can expect to have their child support application processed in a shorter amount of time, which will ultimately decrease the waiting period for collections to begin. And because we’ve been able to streamline the overall application process, each applicant’s experience will improve tremendously with all of the enhancements.” To access the application, visit dhs.maryland.gov/benefits. 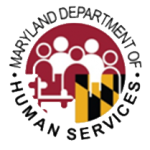 DHS—the Maryland Department of Human Services—is the state’s primary social service provider, serving more than one million people annually. Through its 24 local departments of social services, DHS pursues opportunities to assist people in economic need, provide preventive services, and protect vulnerable children and adults in each of Maryland’s 23 counties and Baltimore City. Additional information may be found at dhs.maryland.gov, or on Facebook and Twitter.